As spring comes to half the world, many people can enjoy the new growth that comes with warmer weather. This is a great time to get outside and get dirty! Gardening is popular in many parts of the world. This outdoor activity gives us beautiful plants, pleasant smelling flowers and fresh fruits and vegetables. But it also gives us many health benefits. Gardening connects people. When you are gardening, you are outdoors. So it is a perfect time to socialize with your neighbors. Most people love to talk about their hobbies, and gardeners are no different. They usually enjoy showing people what they are growing. And most enjoy sharing advice and stories about their gardens almost as much as sharing herbs, flowers and vegetables from their gardens. Gardening can greatly widen a person's community. Some people may not have the resources to have their own garden. So, many cities and towns have community gardens. You can either volunteer or just visit to learn more. Check what resources are available to you in your area. If there are no community gardens near you, there may be government money available to help you start one. Gardening is a great activity to do with children. It gets families outdoors and off computers, televisions and other electronics. Gardening can be a great teacher. Children can learn about nature and wildlife. Gardening can teach a child about where food comes from and healthy eating. It can also help them to understand the limits of natural resources and the importance of using them carefully. When you are in your garden, you might feel the sunshine on your skin. This means you are getting Vitamin D.
Vitamin D helps our bodies use calcium. That is necessary to keep bones strong. Vitamin D also helps us fight diseases. Also, when you garden you must move around. All the different movements needed for gardening -- bending, twisting, stretching and lifting -- work small muscles in the body. And you can easily get a good work out when you are digging holes or pulling weeds. Gardening may also help you to feel calm and happy. 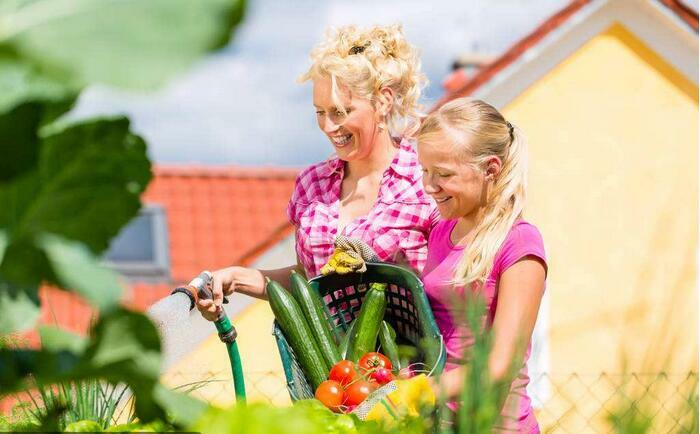 A study by researchers in the Netherlands found that gardening may reduce the stress hormone cortisol in the brain. Scientists say that high levels of cortisol in the body interfere with learning and memory. It can also increase a person's weight, blood pressure and cholesterol levels. Chronic, high levels of cortisol increase the risk for depression, mental illness and lower life expectancy. In the study, the researchers gave 30 gardeners a difficult, stressful task. After completing the task, researchers measured their cortisol levels. The gardeners self-reported on their mood, or how they felt emotionally. Then the gardeners were asked to recover by either gardening outdoors or reading indoors for 30 minutes. Both activities led to lower cortisol levels. However, the decreases were stronger in the gardening group. Also, those who gardened reported that their good moods returned fully. The readers found that their bad moods only got worse. Gardening may help your brain stay young. In another study in 2006, researchers looked at more than 2,800 people over the age of 60. They studied their lifestyle habits, activities and health over a 16-year period. They found that gardening could lower risk of future dementia by 36 percent. Activities such as gardening uses many repeated actions, such as weeding or dead-heading (removing dying flowers from a plant). These actions have a calming effect on the brain. The brain is still active but not in the same way that it is, say, when we use computers. In our technology-filled lives, gardening offers a chance to unplug. You cannot hold a phone or other electronic devices when your hands are filled with dirt. Gardening can also give you the feeling that you have done something good. A flower and herb garden can help feed bees and butterflies. Growing herbs and flowers, even in a of couple of pots at your city home, connects you to nature and pleases all of your senses. What you grow in a garden usually looks, smells, feels and tastes really good. This difference in approach has led to several political skirmishes. Exercise will not only lower blood pressure but possibly protect against heart attacks. We all like outdoor activity, especially camping. Such positive lifestyle habits have a positive impact on your job search, she says. 5.But it also gives us many health benefits. The advent of modern medicines has brought significant health benefits at lower cost. 6.Also, when you garden you must move around. He moved around the country working in orange groves.